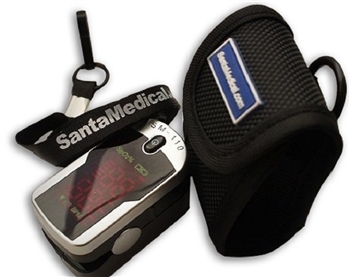 The Santamedical SM-110 oximeter provides reliable oxygen saturation and heart rate values without compromising accuracy. The SM-110 is for anyone who is interested in knowing their oxygen saturation and heart rate. It can be used by a variety of sports enthusiasts, including mountain climbers, hikers, skiers, bikers, and others interested in measuring oxygen saturation and pulse rate. Comes with batteries, lanyard and carrying case. Battery type : 2 AAA Alkaline batteries or rechargeable, batteries. The oximeter that I ordered from Concord met all my expectations. It is easy to read and easy to change batteries when necessary. Works great and furnishes information needed. Will be looking into respiratory products in the coming weeks.